This trick was very kindly given to me by Mr. Dai Vernon, the famous card expert, breaks new ground. The effect is that any pack, having been thoroughly shuffled, is placed in the performer's hand, which he holds behind his back, and is then covered with a handkerchief, in which it is securely wrapped. Any number is called by a spectator. The magician names a card. The spectator uncovers the pack, counts to the number and finds there the card called. The method is subtle. When the pack is covered with a handkerchief, in bringing it to the front, turn the cards face up and sight the top card's index by stretching the fabric a little at that point. Hold the pack with the left forefinger below and the thumb at the index corner, ready for a riffle count. As you ask the spectator to name a number, riffle off five cards. As soon as he calls a number continue the count till you reach it. Bring your right hand over the pack and make the pass at that point under the handkerchief. Turn the deck over, under cover of wrapping it securely and hand it to the spectator. All done in a few seconds. After much pretended mental exertion, name the card you sighted. The spectator unwraps the pack, deals cards to the number he called and finds there the card you named. 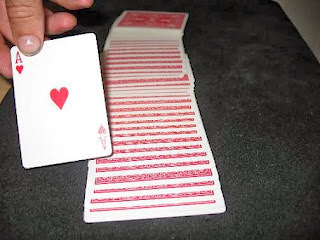 A good presentation is to have the spectator run over the faces of the first dozen or so cards after he has shuffled and your pack is turned, just glancing at the cards and not trying to remember any of them. When the deck is covered have him call a number between one and fifteen, so that the choice, you say, will be restricted to the cards he saw, really to limit the thumb count. Explain that his subliminal consciousness has registered the positions of the cards and that altho he will not be able to recall them, you will pick up the waves of cerebration. Impress on him to make no effort to remember the card, simply to remain passive. Proceed to name the color, suit and finally the value. The thumb count must, of course, be made noiselessly but it can be done quite deliberately since the hand is out of sight. I can recommend this as being one of the most mysterious feats possible with cards.